The Hamilton County seal is seen on the wall behind Jeffrey Davis as he interviews for General Sessions Judge before members of the Hamilton County Commission in the County Commission assembly room at the Hamilton County Courthouse on Wednesday, March 20, 2019 in Chattanooga, Tenn. Current General Sessions Court Judge Clarence Shattuck, 83, announced he will retire on April 1. 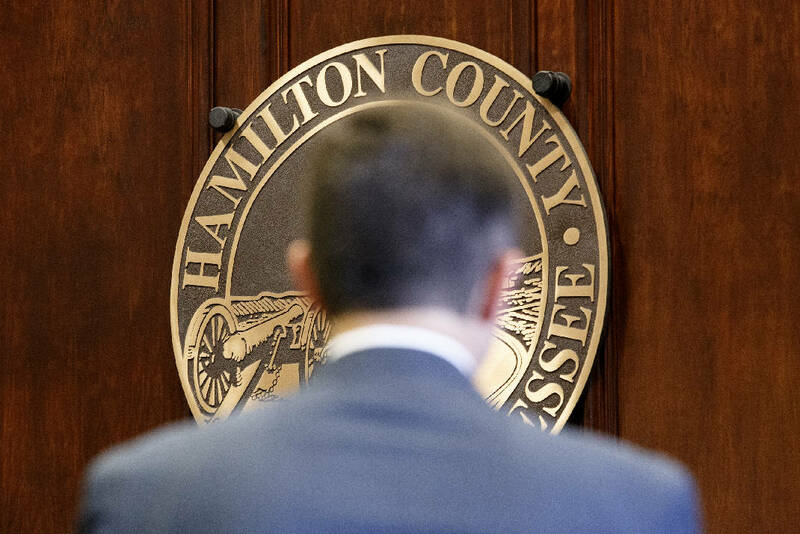 The Hamilton County Commission is one step closer to voting on a new General Sessions Court judge after interviewing nearly 20 applicants Wednesday. Going from 1 to 6 p.m., commissioners heard from 17 attorneys with wide backgrounds: public defenders, prosecutors, magistrates, current municipal and city judges, attorneys for the Department of Child Services, counsel for the Moccasin Bend Mental Health Institute and private lawyers alike each vied to replace Judge Clarence Shattuck once he retires April 1. Commissioners will consider their pitches — and two other applicants who could not make Wednesday's interview — before voting on March 27. If the commission votes on a replacement, that replacement will have to run for re-election in August 2020. Though commissioners hinted Wednesday at there being a few front runners, they did not name them. They primarily asked applicants how their qualifications made them stand out and what improvements they would make to General Sessions Court, the starting place of roughly 50,000 criminal cases and civil claims ranging from fee collections, property disputes and housing issues. Commissioner Warren Mackey also asked nearly every applicant what their feelings were on the Hamilton County Jail costing roughly $95,000 every day, and what they could do as a judge to help alleviate the overcrowding. Many suggested a continued emphasis on alternative sentencing and wraparound services for defendants dealing with mental health issues. Defense attorney Gerald Webb, a former prosecutor and corporate litigator for Life Care Centers of America in Cleveland, Tennessee, who currently sits on the board for Erlanger hospital, said people get stuck in jail on minor probation violations and clog up the system. If selected, he said he could only handle time-consuming preliminary hearings so the other judges can work through different issues. Leslie Longshore, an assistant district attorney, pointed out that a lot of cost comes from incarcerating people pretrial, and that supporting pretrial release programs could help alleviate cost. David Schmidt, another veteran prosecutor who has worked in General Sessions Court the last three or so years, said solutions should be determined on a case-by-case basis. Some defendants need tough love through jail time; others who really want help can benefit from drug-release and mental health programs, he said. Two applicants said they were only interested in holding the seat until the 2020 election, should the commission fail to pick a replacement through vote: Phillip Strang, a longtime area attorney who focuses on workman's compensation issues after beginning in corporate and municipal defense, and Boyd Patterson, an assistant public defender and former prosecutor who also directed the city's Gang Task Force between 2011 and 2013. "I don't know that the will of the commission is to appoint a stump," said Commissioner Greg Martin, but he and others thanked Patterson, Strang and everyone else, nonetheless. Two of the applicants are already judges: Kevin Wilson, the longtime judge in Collegedale, and Cris Helton in East Ridge. Though he can be stern with those who lie in his courtroom, Wilson said he enjoys working with people and helping them become compliant with the law, whether it's getting their driver's license reinstated or dealing with an insurance issue. He said he has the passion and experience for the position. Helton, who beat East Ridge city judge incumbent Arin Reingold in 2014, said he's electable and has a history of sitting as a special judge in Hamilton County General Sessions Court when the judges are down a body. Helton suggested every court in the area — Soddy-Daisy, Red Bank, Collegedale and others — should use the county's criminal website database so that judges can have more information in real time about a defendant's full criminal history when making decisions. Helton also noted that he wouldn't have conflicts of interest like some of the other applicants. He appeared to be alluding to Webb, whose firm has represented a major bonding company in town and numerous defendants in criminal cases over the years. If appointed, Webb said, he would have to recuse himself if a client either he or his partners represented reappeared before him on a new issue. If appointed, Webb would also be the only judge of color in Sessions Court. All together, the applicants are: Larry Ables II, Kevin Beck, Jeffrey Davis, Scott Grant, Joseph Hollis Jr., Helton, Jeffrey Kopet, Mike Little, Longshore, Patterson, Bill Pemerton, Ron Powers, David Schmidt, Elizabeth Schimidt, Rex Sparks, Strang, Carmen Ware, Webb and Wilson.